This one is the same size as our world, and may have water on its surface. Scientists using NASA’s Kepler telescope have found the first Earth-size planet orbiting its star at just the right distance for water to exist on its surface. 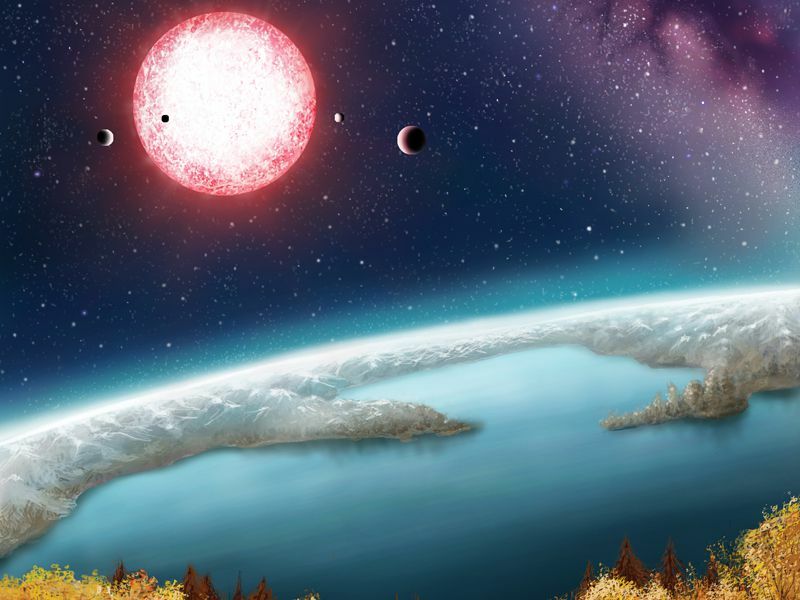 The finding, reported in this week’s Science, is an important milestone, but only one step in what’s likely to be a long road to identifying habitable planets. The new world is the outermost of five Earth-size planets discovered circling a red dwarf star called Kepler-186, which is about 500 light years away. Because the star is cooler than our sun, its habitable zone—the region where liquid water could exist without boiling or freezing—is closer in. That made the scientists’ job easier, since finding small planets in wider orbits requires more observing time. Astronomers have already discovered dozens of large gas planets in stellar habitable zones, but this is the first of Earth’s size—or rather, the first to pass the stringent confirmation process. A team led by Elisa Quintana of the SETI Institute enlisted large ground-based telescopes to search around Kepler-186 for a background star or faint, unseen stellar companion that could have masqueraded in the Kepler data as small planets. Finding none, they stuck with their original conclusion that they were seeing a distant planetary system. Quintana and her colleagues presume that Kepler-186f is rocky based on its size, even though they don’t yet know its density. Furthermore, he said in a NASA press conference today, “Just because a planet is in the habitable zone, it doesn’t mean it’s habitable.” Many other factors, from the presence of an atmosphere to the composition of the crust, are likely to affect the chances that life (or terrestrial-type life that we would recognize) could exist there. In other words, we’re still a long way from finding another world just like our own.